Some of you may be wondering, "What in the heck is that!" and I don't blame you. A few years ago I thought it was a faint memory from my childhood, and much more colorful now. These are FuzziBuns cloth diapers. Many of you may still be confused, but this is the route we have choosen to go with Tate. In June, after much thought with 2 in diapers, the enormous landfill we were creating with our on diaper collection and to be good stewards of our money, we took the plunge. Literally, into the toilet! 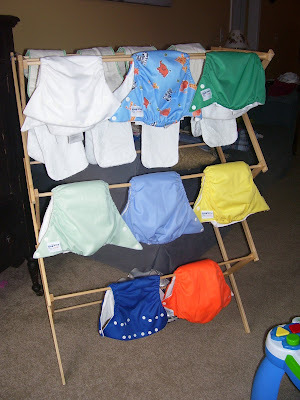 Daily or should I say every few hours, I will wash out the diapers, place them in a "holding" bin unitl the end of the day, and at that point, I throw all the diapers from the day into the wash and hang them up to dry overnight. Yes, I will not lie, it is more effort, time and energy on my part, but to know that we are conserving environmentally and financially, so I press on. Our family by no means gets the award for eco-friendly lifestyle, but to know that I can start this one change to impact my children's future home is gratifying.